I absolutely love dining room benches! I had found this dining room bench at the thrift store for a measly $15. It was perfect for my dining room table, for which I had only paid $12.00. (I have excellent luck at finding deals–what can I say??). But it was one of those pieces of thrifted furniture that you bring into the house and it takes you years to make over. 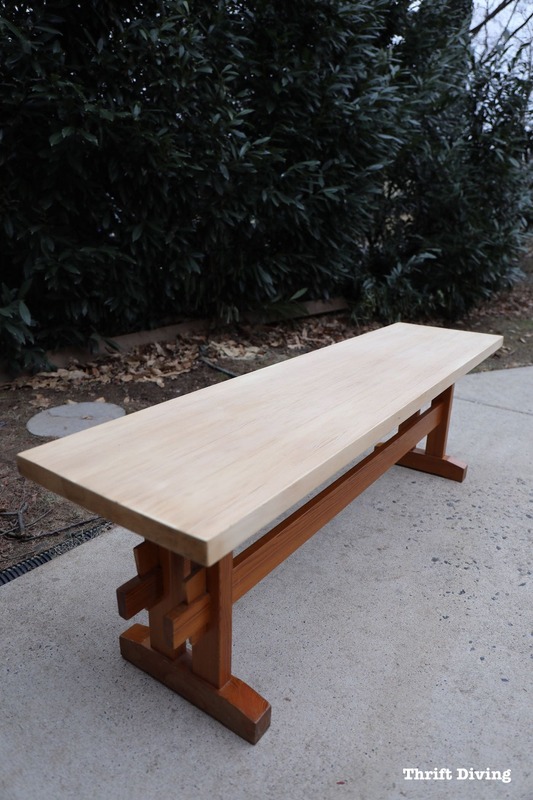 I’m happy to say, though, that I finally completed this dining room bench makeover! If you looked closely, it had a lot of surface imperfections and battle wounds. I was hoping that giving it a good sanding down would remove much of that. With the 1980’s orange stain gone, the body painted in a rich mocha-color, and the top stripped and kept natural, I love how it turned out! It was refreshing doing a furniture makeover that didn’t take much time! Combined, this project only took about 2 hours! 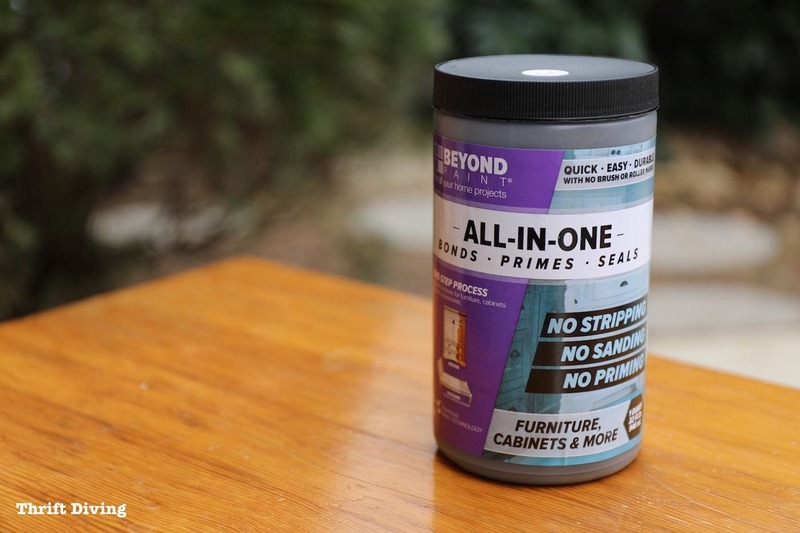 Beyond Paint doesn’t require any sanding or priming (as long as the surface of the furniture is in good condition). But you do have to wipe it off first to remove any grease or dirt. Otherwise, paint won’t stick. 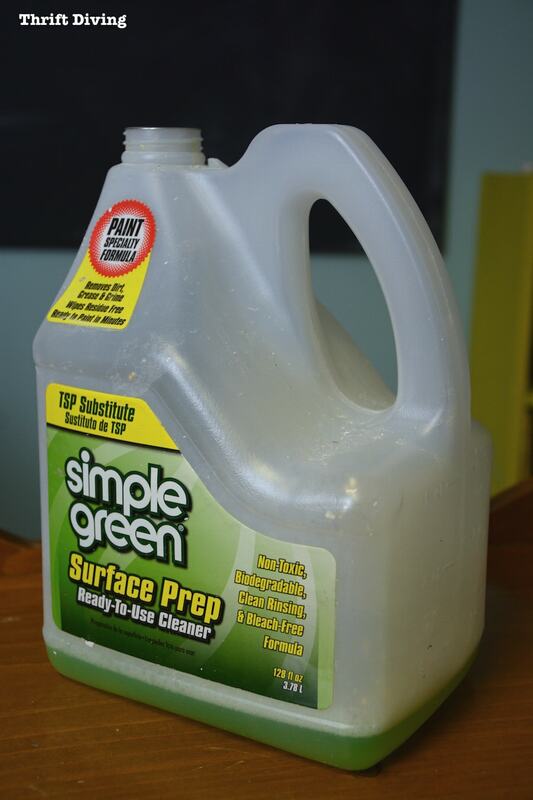 Once you’ve cleaned it with Simple Green, wipe it off with a fresh, clean damp rag. It’s getting harder and harder for me to willingly cover up a nice wooden top on a piece of furniture because I absolutely love the look of stripped wooden tops and painted bodies. The same was true for this bench. There is more than one way to strip furniture. I didn’t want to spend a lot of time on this project because my “To Do” list of other projects is longer than my arm. So I decided to go with the quickest method of stripping furniture: a belt sander. I should also tell you that a belt sander is super aggressive, so sand with caution, my friend. While it does remove layers with uncanny quickness, my goodness–the risk of removing too much wood is pretty high. 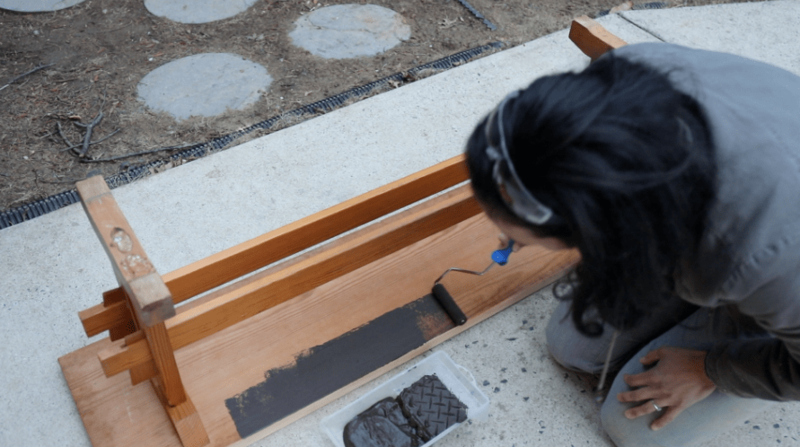 Within seconds, layers were removed, revealing the fresh wood underneath. I noticed that there were still some parts of unevenness, but I just assumed that it was just the wood. I got a little too “sander happy” and ran into a couple of patches where the sander removed too much wood and left bare spots like you see here on the edge of the dining room bench. 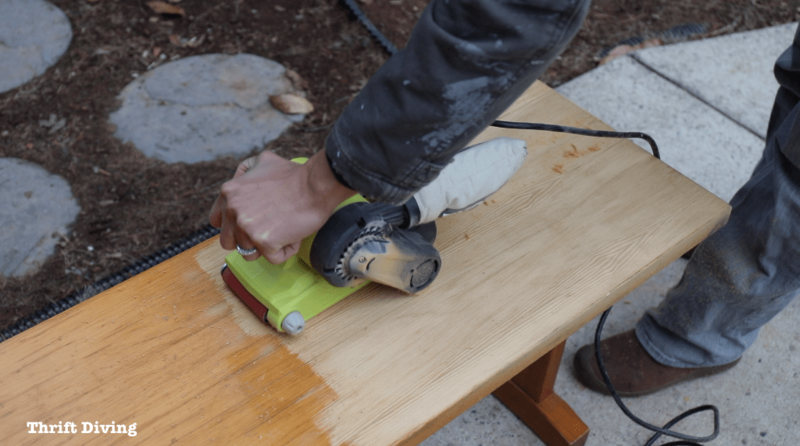 When sanding over edges, it’s super important to keep the sander completely flat and fast-moving to avoid this very thing happening. 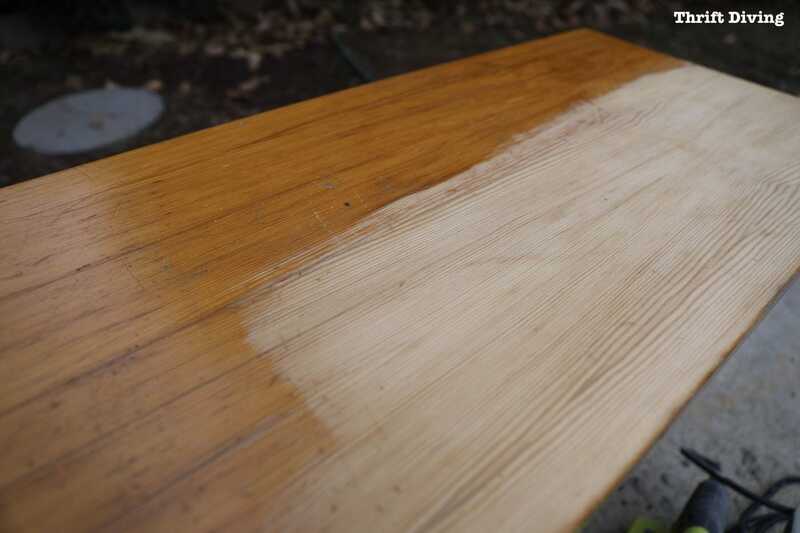 If you’re sanding and get bright, bare-wood spots, too, it’s impossible to stain the wood because those bare spots won’t accept stain and they’ll be even more noticeable the darker the stain used. 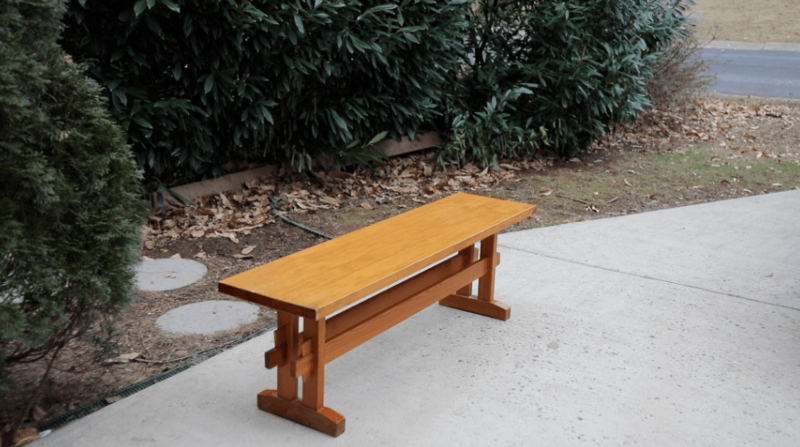 But for this bench, if I kept the top light and natural, not only would it look great with the dark painted base, but it would help to disguise the bright spots. 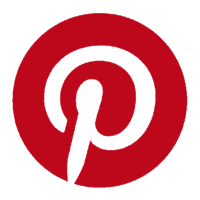 But one color I had never used…..ever….is Beyond Paint Mocha. 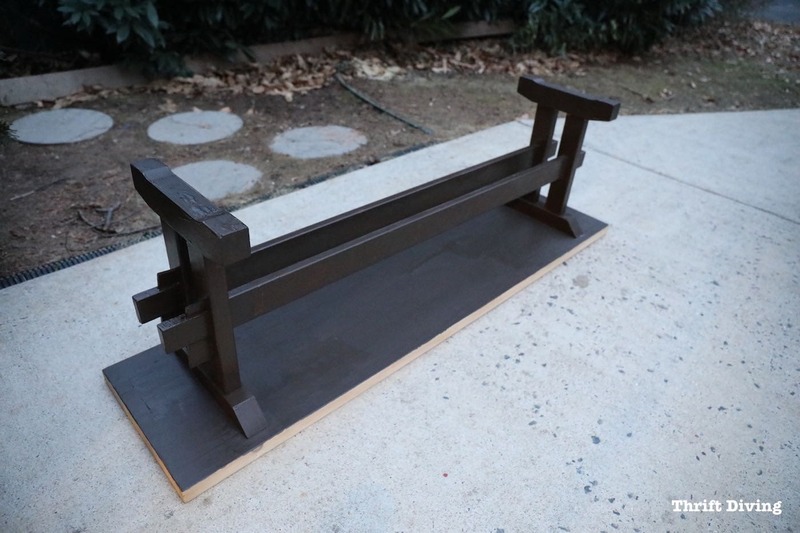 I’m not a “brown furniture” kind of person, so I was a little unsure how it would look on my dining room bench. But life is boring–if you never venture outside of what you already know, how do you discover new things?? 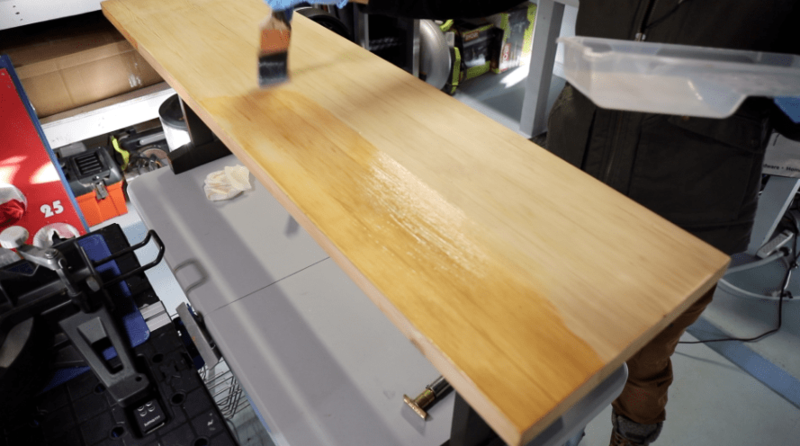 I’ve used a lot of furniture paints in my day (find out my about my experience with furniture paints), and while I like painting furniture, it can take so long as you try to work the paint over the surface, hoping it doesn’t drip and look horrible. 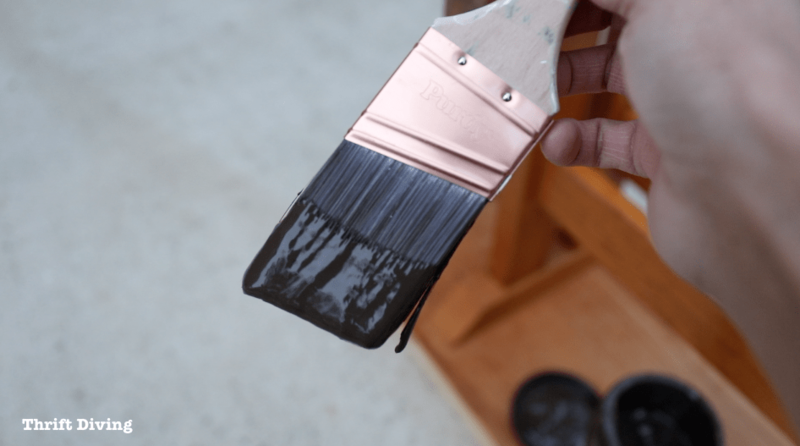 It doesn’t drip, and when worked with a small roller (to eliminate brush strokes), you get a smooth finish that doesn’t take long. 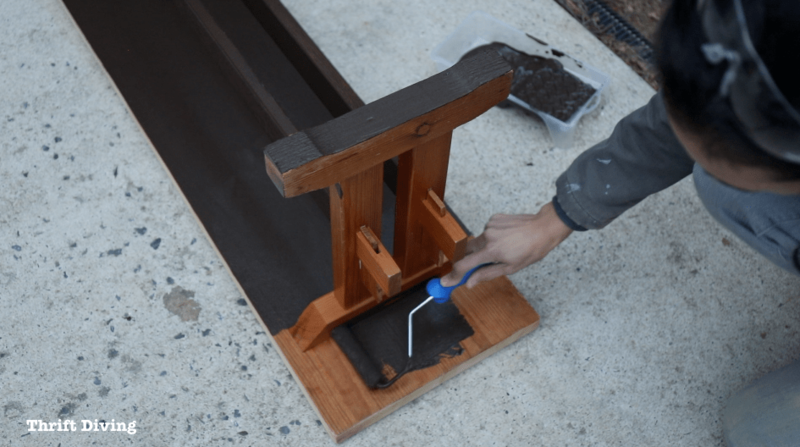 It only took about 10 minutes to paint this entire base and bottom of the bench with a coat of Mocha. I left the bench to dry overnight since I was running out of daylight. The following day, I added a second coat of Mocha for even coverage. 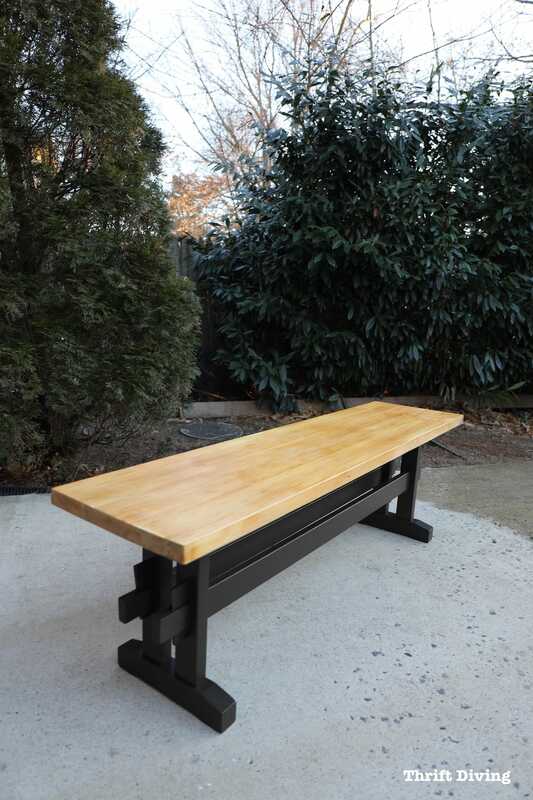 It was so hard to figure out what to do with this dining room bench top. I debated on whether to just paint the top to cover up the bright spots due to sanding, or to just leaving the top natural. 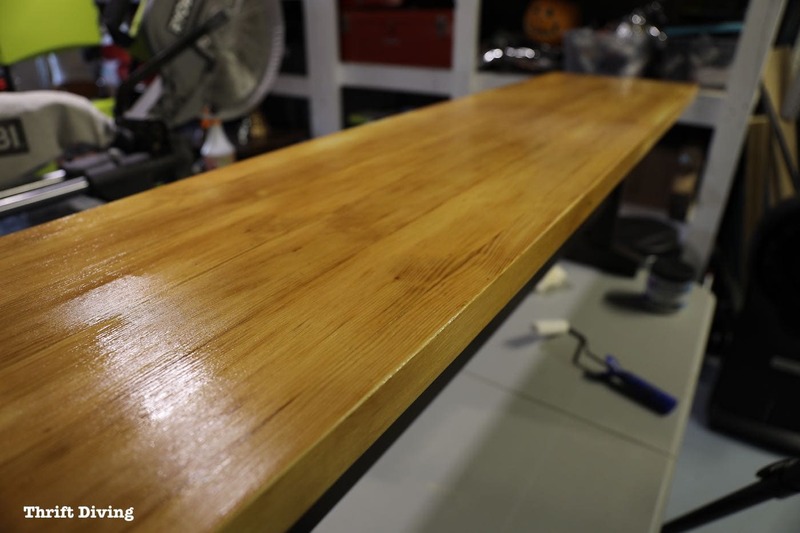 I had some topcoat leftovers in my garage and used a paintbrush to apply two coats of satin sealer. 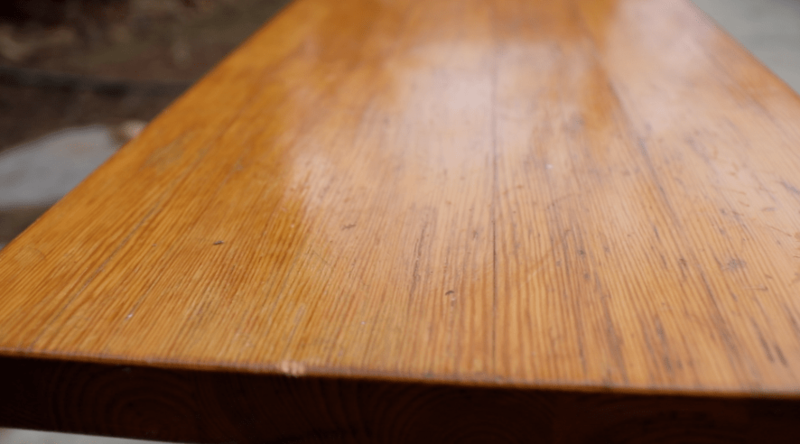 The topcoat brought out the warmth in the wood without being too overwhelming orange. Plus, the color of the wood complemented the new Mocha base! I absolutely love the after! 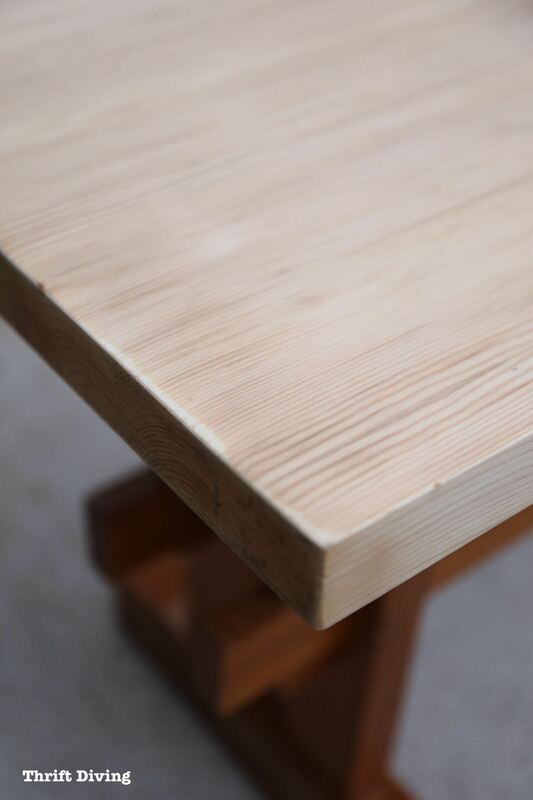 The top seems a bit spotty, and I’m not sure if that’s due to sanding or if it’s the nature of the wood. But regardless, it looks a million times better and that contrast on the dining room bench between the dark base and light top makes me very happy. What’s even more shocking is that hubby told me he likes the bench! GASP! If you’ve been reading this blog for any length of time, you’d know that he’s nearly impossible to impress. He doesn’t hand out compliments very easily, so for him to offer a compliment that the bench looks getter–whoa! Success! Do you like this project? Click here to SAVE it for later! 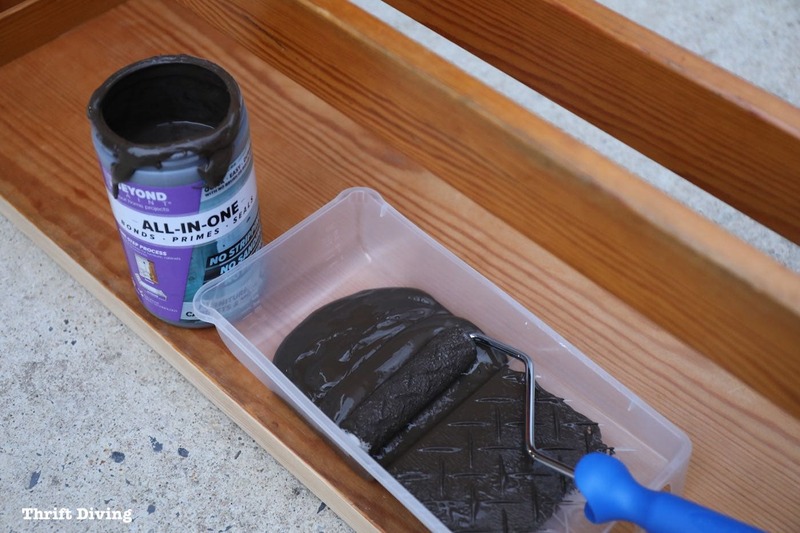 If you liked this dining room bench makeover, be sure to check out Beyond Paint for the mocha furniture paint! I love your bench makeover! You did such a great job explaining every step, I feel like I could do this project. The paint color you used looks great with the lighter wood on top. Thanks for sharing your DIY with the #HomeMattersParty this week. I love the look of painted base and wood top, nice job! Loved the video. My Twin sister and i laugheded the bigginging. We have tipped over my table bench so many times. 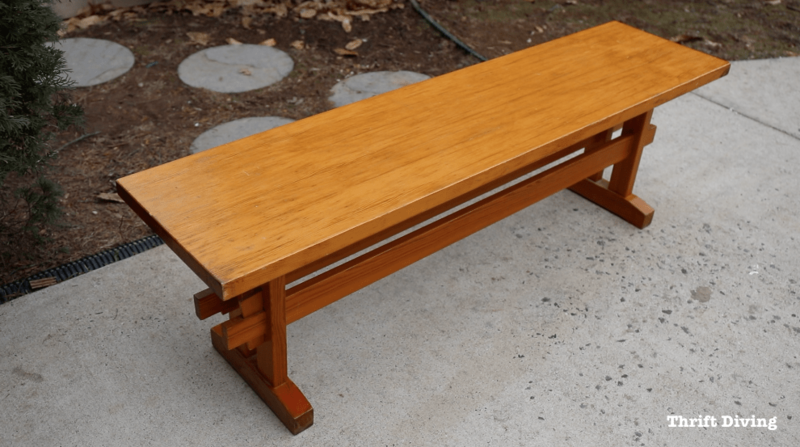 The bench was great prior to the makeover very chic almost streamline asian look. The makeover gave it a whole new facelift. My sister and i love it! Very chic. Very clean. Something you could use with the table or on its own. You did an Amazing job!. 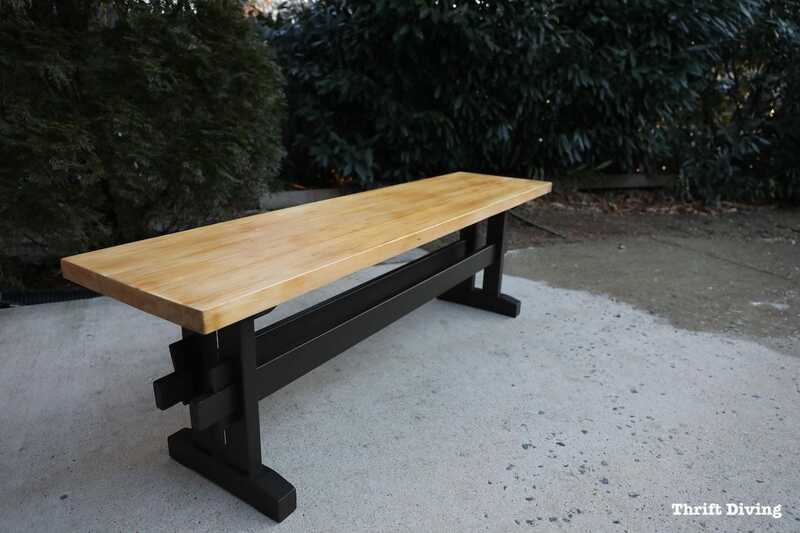 Love this bench! Exactly what I’ve been looking for… need your good luck when I’m out looking. Thank you for sharing!